Cette propriété est située dans une courte distance de marche de la rue Macrossan principal quartier commerçant de Port Douglas, il est également très proche de la plage et du port de plaisance. Situé dans un petit groupe de maisons de ville et entouré de jardins tropicaux, nous vous proposons un entièrement autonome, plus grande que la propriété moyenne qui peut être loué avec une ou deux chambres à coucher donc appropriés pour un couple, une famille ou deux couples. Il y a une piscine dans le complexe pour votre plaisir, il est très calme et privé idéal pour bronzer et se baigner de refroidissement. Port Douglas est situé à 1 heure au nord de Cairns, une route spectaculaire qui vous emmène la belle mer de Corail passé avec vue sur les plages de sable et des collines boisées tropicales. Vous pouvez voyager en bus de navette, location de voiture ou de limousines tous disponibles à partir de Cairns aéroports internationaux et domestiques. Marlin Terraces est situé dans la rue Mudlo, à une courte distance de la rue Macrossan. The house is central to everything with all amenities included. Place was clean and had everything we required. Janice was a pleasure to deal with. This home has everything you could need for a home away from home. 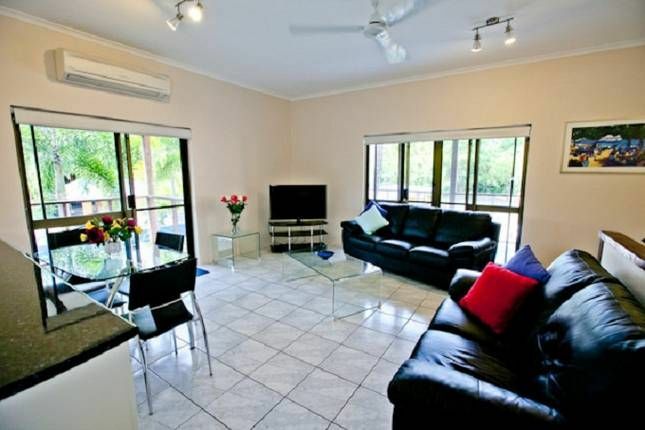 Clean and tidy with ample home facilities. Wifi would have been a great addition and the pool side loungers need replacing as they are broken. A great location and we had a fabulous stay here. Would definitely recommend. We very much enjoyed our stay here. We had lots of room, the beds were very comfortable, and the bathrooms were very clean. The kitchen had all the necessary basics, and there was an electric grill outside for barbecuing. The air conditioning was extremely efficient, so we were very comfortable. Two notes: there is no wifi available, which wasn’t a big issue for us as we had lots of data through our mobile plan, and the pool on the property is tiny - something to consider if staying during stinger season and you have kids wanting to play in the pool - It would likely be fine for the under-7 set. Again, it didn’t affect us in any way. Overall, very much enjoyed our time here and would definitely stay again! We enjoyed our stay. Spotlessly clean, comfortable, close to shops. Well stocked. Thanks Janice, this is a lovely apartment: fresh, clean and bright with big comfy beds, great kitchen, leafy views, and lots of bird song. Nice private little saltwater pool all to ourselves. A short walk to town, beach and Sunday market. I'd go back anyday! Thanks for having us! I stayed in this townhouse for about a week in November of 2016. It is very nice with a well stocked kitchen and in a good location. You can pretty much walk to the beach or to downtown to stock up your kitchen.